Simran is unfairly stacked against its main character, putting her in a no-win situation while expecting her to sustain the film’s humorous tone. Kangana Ranaut plays Praful Patel, a housekeeper at an Atlanta hotel. She lives with shop-owner parents, and she’s been saving money for seven years in order to buy her own condominium. Few Bollywood films feature working-class Indian-Americans, so it’s gratifying to see such characters onscreen for a change. On a bachelorette weekend in Las Vegas with her cousin Amber (Aneesha Joshi), Praful gets lucky playing Baccarat, winning enough to indulge in some high-end shopping and dining. Her second round doesn’t go as well, forcing Praful to keep gambling in order to try to win her money back. She mistakes a cash infusion from loan shark Mr. Bugs (Jason Louder) for a gift, endangering not just her future plans but her very life. In the grand tradition of Bollywood movie parents, Praful’s folks’ only desire is for her to get married — again. Her first marriage didn’t work out, and she’s now happily independent. While her parents’ latest target — MBA student Sameer (Talvar‘s Sohum Shah) — is a nice guy, Praful isn’t keen to settle down. The rift between Praful and her parents goes beyond her unwillingness to wed. It’s so deep that it undermines the whole tone of the film. There isn’t a single moment of affection between Praful and her domineering father. He says that he wishes he never brought her to America from Gujarat, castigating Praful for being worthless in the same breath that he asks her for money to pay the electric bill. Praful’s mother is of no help. When Praful’s efforts to pay off Mr. Bugs get her into further trouble, there’s no one she can turn to. Her parents don’t like her. Sameer doesn’t believe her. Praful’s housekeeping co-workers help in what limited ways they can, but they’re just as broke as she is. Cousin Amber is rich, but for some reason she disappears in the second half of the film. Praful is utterly alone. From a narrative standpoint, it’s unfair to ask Praful — the film’s only multi-dimensional character — to supply all the laughs when the audience can see how hopeless her situation is. Ranaut’s compelling performance fosters so much empathy for Praful that it becomes impossible to laugh at her plight. As Simran progresses, it becomes depressing and surprisingly violent. It’s as though director Hansal Mehta failed to consider how the audience would feel while watching the movie. I’m not sure if Simran is the story he thought he was telling. This entry was posted in Reviews and tagged 2 Stars, 2017, Aneesha Joshi, Bollywood, Hansal Mehta, Hindi, Indian, Jason Louder, Kangana Ranaut, Movie Review, Simran, Sohum Shah on September 15, 2017 by Kathy. In Ship of Theseus, writer-director Anand Gandhi explores what distinguishes us as individuals through three vignettes about organ donation. It’s a thought-provoking piece of work that periodically veers into self-indulgence. The film begins with a written description of Theseus’ paradox. If one were to replace every component of a ship, would the end product still be the same ship? Gandhi asks that question of the human body: how many parts can be replaced and still be considered the same person? That conundrum is explored the most directly in the first vignette, about a blind photographer. Aliya (Aida El-Kashef) took up photography after losing her eyesight, and she relies upon her boyfriend, Vinay (Faraz Khan) to describe to her the pictures she takes. A cornea transplant restores her sight but alters her instincts as a photographer, to Aliya’s detriment. The most interesting aspect of Aliya’s story is the way Gandhi uses sound to tell it. Before the surgery, Aliya listens to the noises on the street to alert her to potential subjects. Her camera’s digital voice tells her the aperture size, and her computer’s voice helps her navigate her editing software. After her surgery, the digital voices disappear. On the street, the cacophony surrounding Aliya hampers her creative sight instead of enhancing it. Credit to sound designer Gábor ifj. Erdélyi for making the same settings feel so different, even though nothing has changed visually for the audience. Ship of Theseus‘ biggest shortcomings are most apparent in Aliya’s story. There’s an excess of dialogue in the movie, most of it consisting of characters philosophizing about the meaning of life. The pseudo-intellectual dialogue doesn’t sound realistic, and characters aren’t given distinct voices. Aliya talks the same as Vinay, who talks the same as Charvaka (Vinay Shukla) from the second vignette. Charvaka is a legal apprentice working on an animal rights case on behalf of a monk, Maitreya (Neeraj Kabi). When Maitreya is diagnosed with cirrhosis, the monk must decide whether to have a liver transplant, even thought it would require him to violate his principles by using medicines tested on animals. The progression of Maitreya’s disease is horrifying and visceral, and Kabi’s physical transformation is startling. Yet it’s most difficult to watch the suffering monk endure Charvaka’s myopic, self-assured musings, apparently generated without an attempt to understand Maitreya’s point of view. The final vignette concerns a young stockbroker, Navin (Sohum Shah), whose own kidney transplant alerts him to the practice of illegal organ trading. Navin’s attempt to recover the stolen kidney of an impoverished bricklayer (Yashwant Wasnik) shakes him out of his shallow, materialistic lifestyle. Navin’s story is the most conventional and is the most entertaining to watch (perhaps because of that conventional structure). Shah’s performance is thoughtful, as Navin attempts to discover answers, begrudgingly realizing that his way is not the only way. 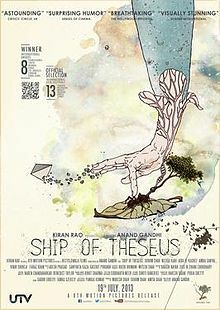 However, Navin’s story highlights Ship of Theseus‘ need of editing. Scenes throughout the movie stretch on without providing insight into characters or plot. There’s far too much time devoted to Navin and his friend trying to park their car in a narrow lane as they search for the bricklayer, and even more time wasted as they are repeatedly sent in the wrong direction looking for the man’s house. The poor state of the neighborhood and Navin’s outsider status within it could’ve been established in half the time. Even the film’s final shots seem less like essential story elements than a chance for Gandhi to show off some neat footage he had on hand. It’s easy to see where Ship of Theseus is going, and much of the ride is quite enjoyable. It just needed to take a more efficient route to get there. This entry was posted in Reviews and tagged 2012, 3 Stars, Aida El-Kashef, Anand Gandhi, Bollywood, Faraz Khan, Gábor ifj. Erdélyi, Hindi, Indian, Movie Review, Neeraj Kabi, Ship of Theseus, Sohum Shah, Vinay Shukla, Yashwant Wasnik on May 16, 2014 by Kathy.